The Ambassador of the Custodian of the Two Holy Mosques in Australia and New Zealand Nabil Al Saleh met with the Minister of Primary Industries in New Zealand Nathan Guy in the city of Wellington, capital of New Zealand, in the presence of Deputy Ambassador Faisal Hifzi. Minister Guy congratulated Ambassador Al Saleh for his submission of credentials as a non-resident ambassador of New Zealand. During the meeting, the Minister also discussed the bilateral relations between the two countries, and the also the issue of transferring technology in New Zealand to Saudi Arabia. The meeting also welcomed the cooperation agreement on arrangements to export livestock, which was signed in Riyadh recently, which would support the balance of trade and also increase the agricultural and livestock investments between the two countries. Ambassador Al Saleh also met the Minister of Trade in New Zealand Mr. Tim Groser in his office in the New Zealand Parliament. Mr. Grosser congratulated the Ambassador on his submission of credentials and also discussed a number of topics concerning the economic and trade relations between the two countries, in particular the signing of the Free-Trade Agreement. 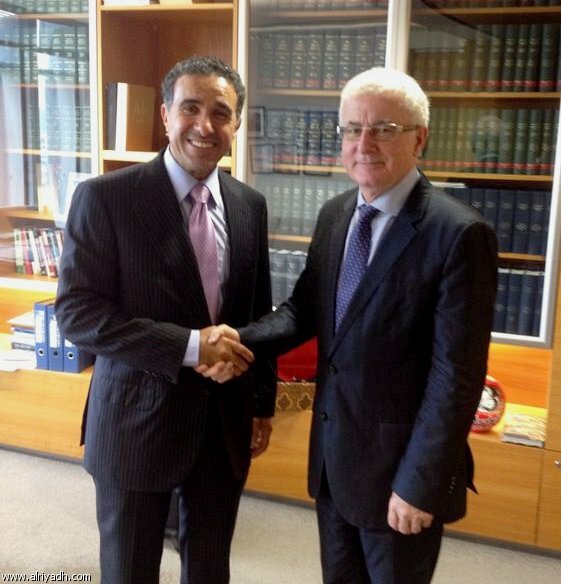 Ambassador Al Saleh and the Deputy Ambassador Faisal Hifzi also held talks with the director of the Middle East Ministry of Foreign Affairs of New Zealand, Jonathon Aston and the NZ Chief of Protocol at the Ministry of Foreign Affairs. Both parties there reviewed bilateral relations between the two countries and a number of issues of common interest. The Ambassador of Saudi Arabia to Australia and New Zealand, Mr Nabil Al Saleh presented his credentials as a non-resident Ambassador to the Governor General of New Zealand Sir Jerry Mateparae, in the Governor General’s official residence in the NZ capital, Wellington. During the ceremony, Ambassador Al Saleh conveyed the greetings and appreciation of the Custodian of the Two Holy Mosques King Abdullah bin Abdulaziz Al Saud and His Royal Highness Prince Salman bin Abdulaziz Al Saud, to the Governor General along with the people of New Zealand, wishing for the peace, progress and prosperity. On his part, the Governor-General of New Zealand conveyed to the Ambassador his greetings to the Custodian of the Two Holy Mosques and the Crown Prince, expressing his wishes for them of good health and wellness. Also wishing the continuing progress and prosperity to the people of Saudi Arabia under the leadership of the Custodian of the Two Holy Mosques. He also expressed his wishes for good luck and success to the Ambassador of the Kingdom in the performance of his duties, stressing his country’s keenness to develop relations of friendship and cooperation with the Kingdom. The ceremony was attended by the Deputy Ambassador Faisal Ghazi Hifzi , the first secretary in the Saudi Embassy Mr. Abdel Qadir Qurdi and the second secretary Mr. Yazeed Al Saleh. (G-20) held its meetings at the level of its finance ministers and central bank governors of the member States in Sydney, Australia between 21 -24 February 2014 . Dr. Ibrahim bin Abdulaziz Al-Assaf, Minister of Finance, led the Kingdom of Saudi Arabia’s delegation to the meeting with participation of Dr. Fahd bin Abdullah Al-Mubarak, Governor of Saudi Arabian Monetary Agency (SAMA), and Nabil bin Mohammed Al Saleh, Saudi Ambassador to Australia. Upon arrival at Sydney Airport, Dr. Al-Assaf was received by Saudi Ambassador to Australia Nabil Al-Saleh, Deputy Ambassador Faissal Gazy Hifzi and a number of other officials. In a statement to Saudi Press Agency (SPA), Dr. Al-Assaf said that the meeting’s agenda includes the latest developments of the global economy. He added that the meeting aims to discuss investment in the infrastructure, including role of small and medium enterprises in this field and the role of the private sector generally to invest in infrastructure. “This meeting is an opportunity to highlight the G20 on the Kingdom of Saudi Arabia’s successful experiment regarding cooperation between the private sector and the governmental sector in the infrastructure,” the Minister of Finance said. Al-Assaf added that the Kingdom’s message to the meeting is to enhance development of the global economy and reduce unemployment, stressing that the Kingdom of Saudi Arabia always highlights issues pertaining to Arab and developing countries. The meetings discuss among other issues the situation of the global economy; investment and infrastructure; and challenges facing the growth and reforms of the International Monetary Fund relating to quotas and governance. 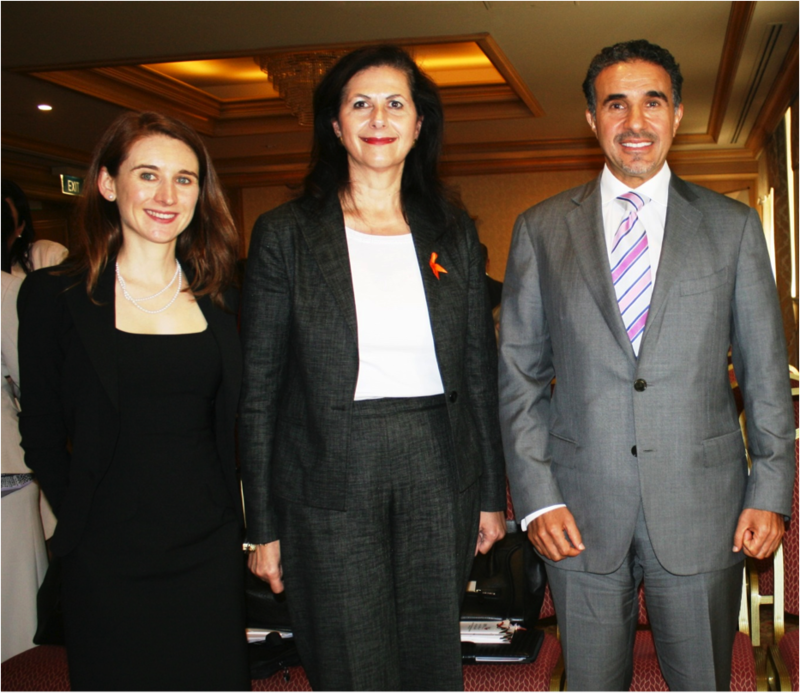 The Australian-Arab Businesswomen Forum was opened under the theme “New Horizons”. 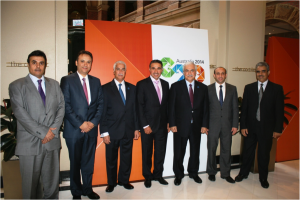 The opening ceremony was attended by Senator Fierravanti-Wells, who has special responsibility for Multicultural Affairs & Settlement Services, Saudi Ambassador to Australia Nabil bin Mohammed Al Saleh and a number of officials. The forum focuses on business opportunities between Australia and GCC member states in addition to means of activating the role of women in this field. Parliamentary Secretary to the Minister for Social Services, Senator Concetta Fierravanti-Wells, today opened the 2014 Australian Arab Businesswomen’s Forum in Sydney. 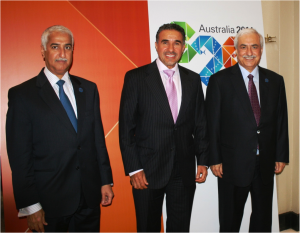 Senator Fierravanti-Wells, who has special responsibility for Multicultural Affairs & Settlement Services, said the event focussed on commercial opportunities between Australia and the Middle East, with a particular emphasis on women. 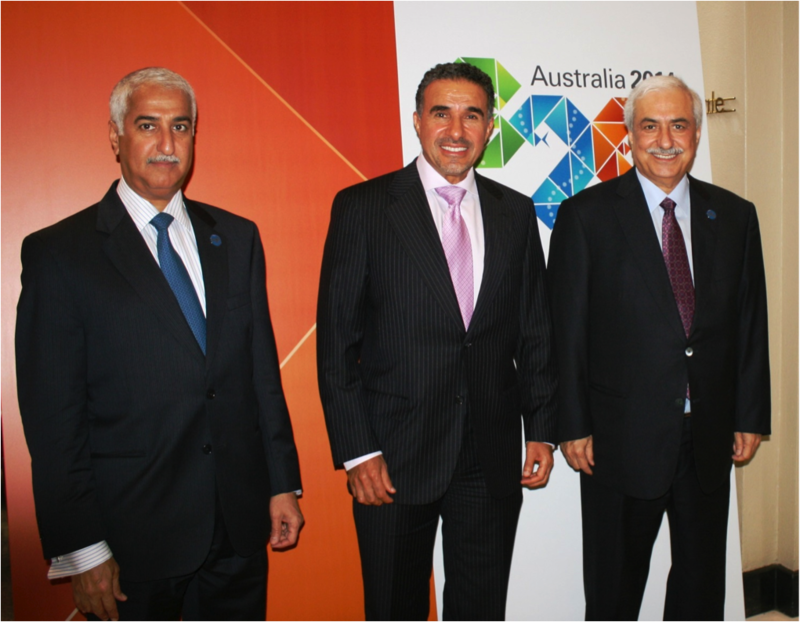 “The 2014 Australian Arab Businesswomen’s Forum will continue to build our commercial and personal links between Australia and the Middle East,” Senator Fierravanti-Wells said. 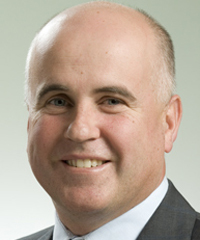 The Saudi Ambassador to Australia H.E Mr Nabil bin Mohammed Al Saleh has met with Australian Minister of Education,Adrian Piccoli in the State of New South Wales. During the meeting, they reviewed bilateral relations between the two countries in the fields of education, particularly discussing the role of Saudi Students who are studying in several NSW Universities and colleges. Mr Piccoli spoke highly of the importance of having Saudi Students in NSW to connect with different cultures to build bridges between the two nations. On his part, Ambassador Al Saleh thanked the Minister of Education in NSW and the various universities for their contribution and cooperation in providing a quality academic environment and education for the Saudi students. His Excellency The Ambassador of the Custodian of the Two Holy Mosques in Australia and New Zealand Mr. Nabil Al Saleh met the new heads of the Saudi Students Club in Australia in 2014 at the Australian embassy in Canberra in the presence of the Deputy Ambassador Faisal Ghazi Hifzi , the cultural attaché, Dr. Abdulaziz Talib and members of the Saudi Embassy. During the meeting Ambassador Al Saleh assured them of the government’s aspirations through the goals of the King Abdullah Scholarships Program. He also assured them of his continued support to student clubs as they continue to play a pivotal role in the reunification of students through cultural and social activities. He also highlighted their contribution in creating the right atmosphere to assist students in their academic achievement, and reflecting the positive side of the Saudi people through respect to all people. In conclusion, Ambassador Al Saleh encouraged the new club heads to double their efforts in the service of their fellow students and wished them success in this round. This meeting was preceded by the first meeting of the heads of student clubs in Australia that was hosted by the Saudi cultural mission in Canberra and was chaired by the cultural attaché Dr. Abdulaziz Talib. The meeting discussed a number of issues of importance including the administrative and financial aspects of the clubs, in addition to a number of topics focusing on work arrangements in the club. Attendees also laid foundations for cultural and social activities for this year. The new club heads expressed their happiness of this meeting, stressing that they will do all they can to serve their colleagues, and amplify the activities that will be implemented through the student clubs at this round. During the meeting, the two sides exchanged views on trade and economic cooperation between Saudi and Australia and reviewed bilateral relations in all fields between the two friendly nations. 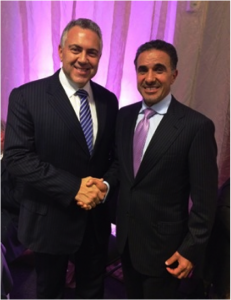 Treasurer Hockey, described Saudi Arabia as an important trade partner to Australia in the Middle East. Ambassador Saleh also said that Saudi Arabia was seeking to further partnership with Australia in all fields. There are also a large number of Saudi students who are choosing to study in Australia, mostly under the King Abdullah Scholarship Program. This program also generated a lot of interest among education providers. The King Abdullah Scholarship is on its own transforming the relationship between two countries.